What have I learn from: Before you quit your job? Before you quit your job? A very interesting book that shows Entrepreneurs can be trained! 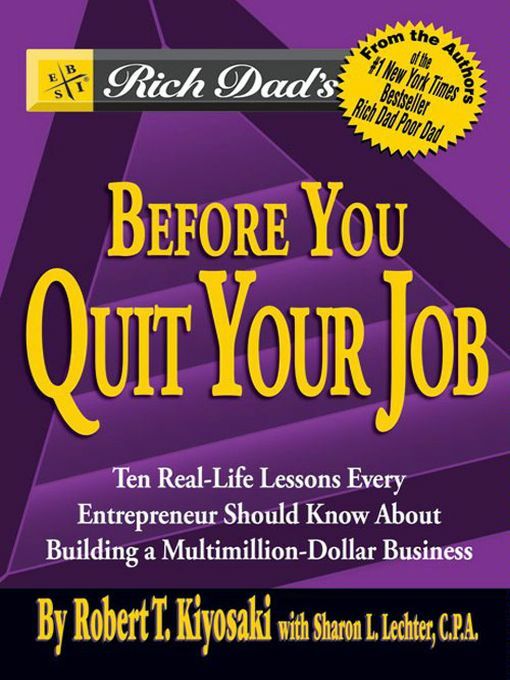 This book highlight the failures that Robert encounters and give us an overview if Entrepreneur is really for you. Starting your own business does not means that you are an entrepreneur ! you can be self-employed entrepreneur because when you stop your business your income stop… Just like what steve blank mention in his blog, successful entrepreneur build scalable business. I will treat the current environment as an learning opportunity, because “Work to Learn Not to Earn” concurrently you can also start a part time business while you are working many are doing that. Take a look the aount of blogshops in Singapore, and people who are doubling up as insurance agent after work. It is hard work but you will learn good sales skills from meeting more people. Legal – is it patented? Systems – how is the operations like? easy to implement? Communications – how to reach market? Leadership – I remember reading the hardest job of a successful entrepreneur is the ability to fire an employees – also you also need to be the Best Sales person in the team. Overall the book gives me the motivation to create start up again and I love this sentence – “The best answer lies in your heart and not in your head” so Take Action. Next Post My new BOB Tote from timbuk2 have arrived!! !